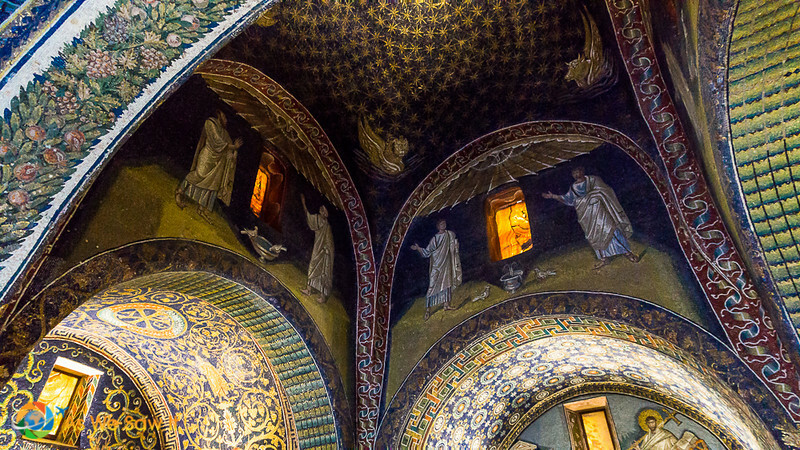 Most people have never heard of the Italian city of Ravenna. A shame, that. 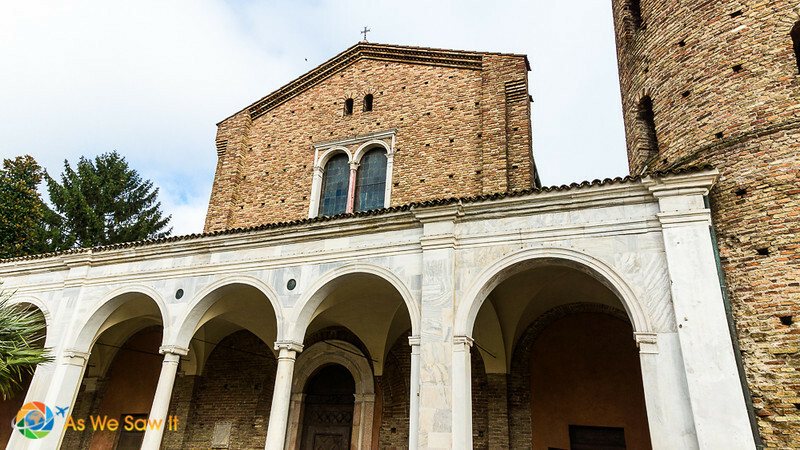 Any visit to Italy deserves at least one day in Ravenna, especially because this lovely port city lies between Florence and Venice. 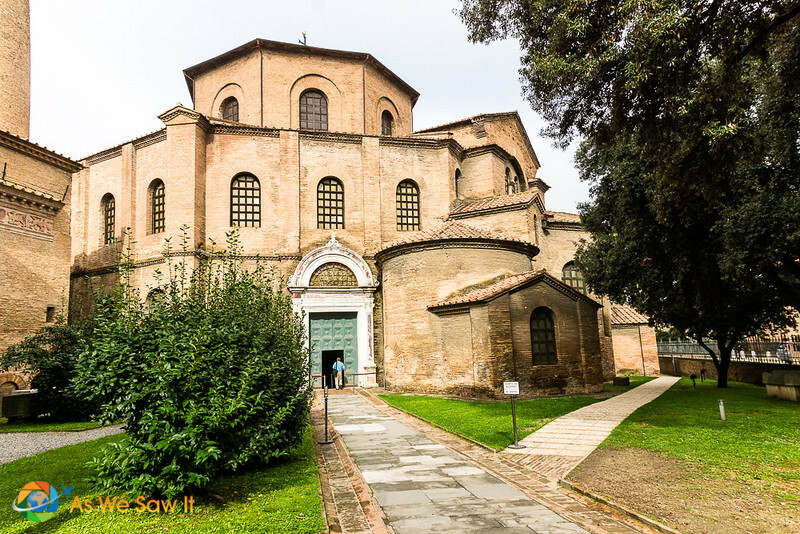 A day trip to Ravenna from Venice or Florence is not only quite doable but really interesting, as we discovered first-hand. 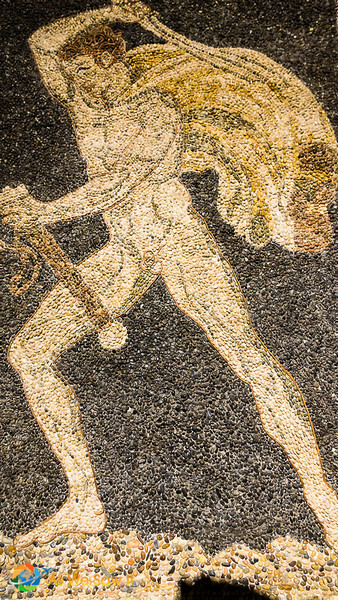 The city is best known for eight ancient sites that have mosaics so superb that they rival those in Istanbul. 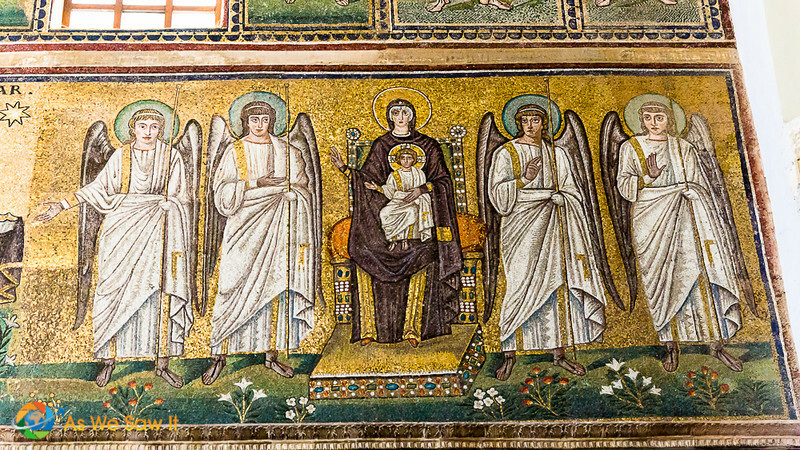 As a matter of fact, it has such exquisite Arian and Byzantine mosaics that it has earned the distinguished designation of a UNESCO World Heritage Site. Back in Roman times Ravenna went by the name of Classe. It was an imperial port for the empire's massive naval fleet and was even—for a brief time—the capital of eastern Rome. Then, in the mid-500s A.D., the Byzantine emperor Justinian decided that Ravenna would be the westernmost pillar of the Byzantine Empire. 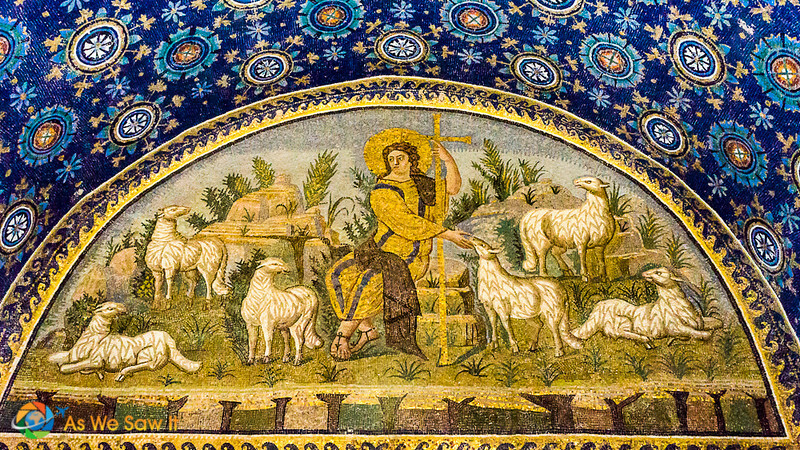 In a nutshell, this explains why there are so many high-quality mosaics here. 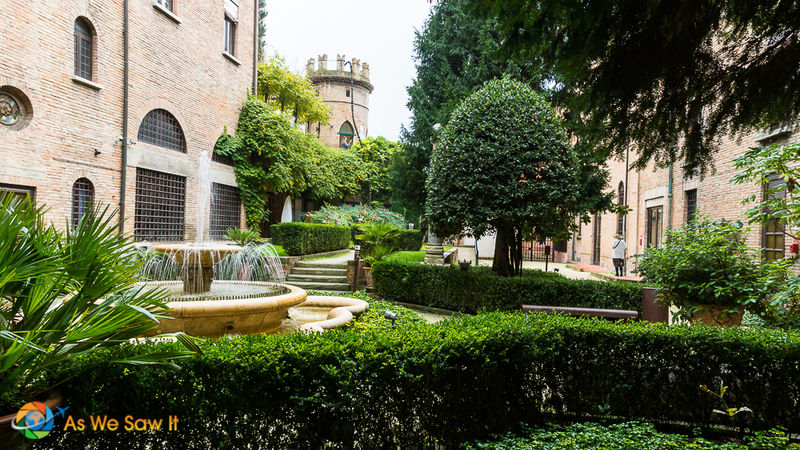 Cruise or no, Ravenna is worth one day on your itinerary. And don't let the location deter you: it's easy to get to by train. If you are in town and want to do it yourself, you can take the Ravenna Hop-on/Hop-off bus as we did (not very comfortable or convenient, to be honest). Although it's only about a 90-minute detour off the train route between Florence and Venice, a train ride from either of those cities takes quite a while (2-3 hours each way). 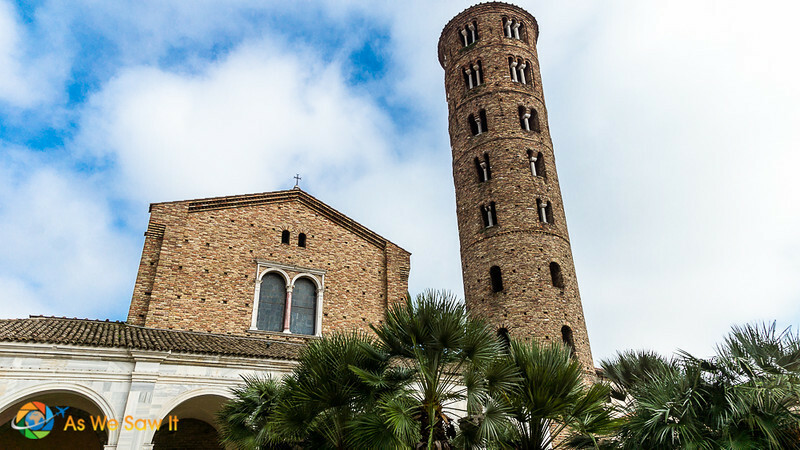 Plenty of companies offer Ravenna day trips, including Viator, and there's a lot to be said for hiring a private guide and traveling in comfort. We couldn't visit every one of the sites because we were only in Ravenna for one day. But no matter. The mosaics we did manage to see were exquisite. Jaw-dropping, even. I couldn't help but wonder how much time each of these mosaics must have taken to create. What talent they had! Each was done with obvious painstaking care. (Can you say stunning?) What looks like a lovely collection of tiny, bright tiles on close inspection will, when you step back, transform into a vivid image of a sea voyage, an image of Jesus, or a choir of angels. This is the full view of the closeup in the previous photo. According to UNESCO this mausoleum is “the earliest and best preserved of all mosaic monuments, and at the same time one of the most artistically perfect.” I don't know how they could have chosen. Every one of the sites is just as artistically perfect, in my opinion. Galla Placidia, daughter of Roman Emperor Theodosius I, was a well-known patron of the arts. Legend has it that she had this built as a mausoleum for her and her family. Three sarcophagi are there and while no one is certain, one is said to he hers, a second belongs to her husband, Emperor Constantius III, and the third is for either Galla's son, Emperor Valentinian III, or her brother, Emperor Honorius. The mausoleum is illuminated by luminous alabaster window panels. 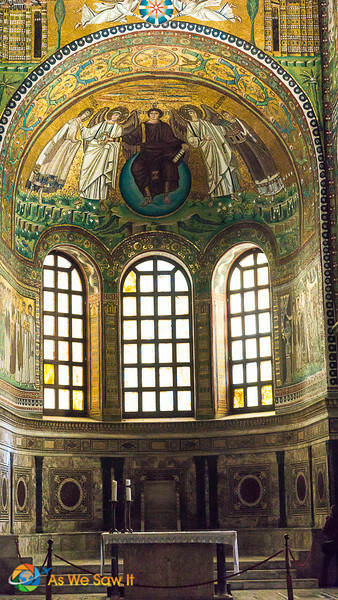 The Arian Baptistry was erected by Theodoric the Great, king of the the Ostrogoths. 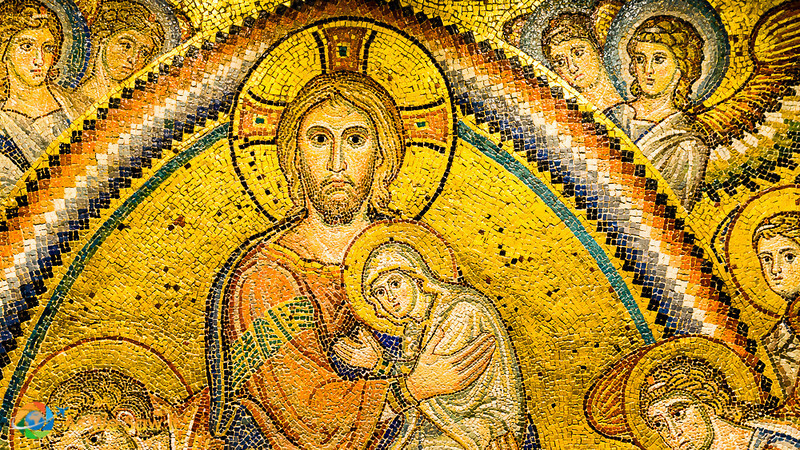 The Goths (Arians) and the Latins (Orthodox) had different views of Christ. 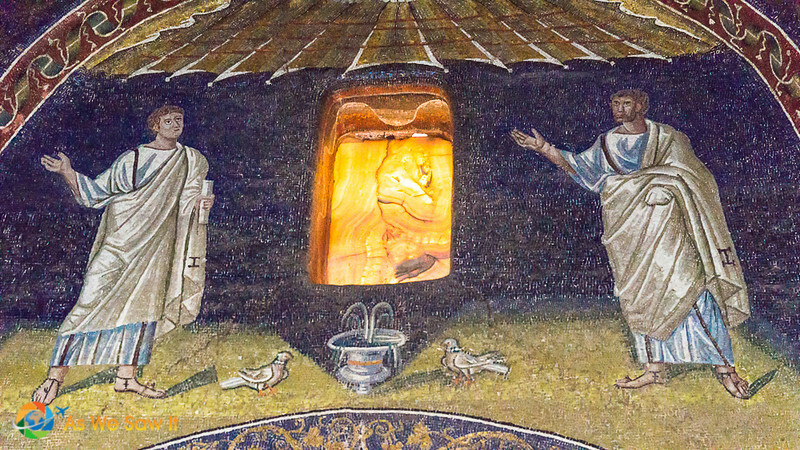 To keep the peace Theodoric built this baptistry “of the Arians” in order to distinguish it from the Baptistry of Neon (of the Orthodox) that had been built a century before. 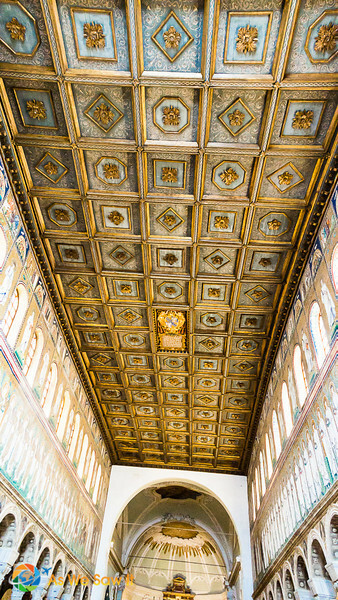 The ceiling mosaic was remarkable. Love those gold tiles! Circling them all is a procession of the apostles, led by Saint Peter and Saint Paul. The same man who built the Arian Baptistry, King Theodoric the Great, built this as his chapel and dedicated it to Christ the Redeemer in 504. Fifty-some years later Justinian I changed its name to Saint Martin in Golden Heaven and dedicated to Saint Martin of Tours, a foe of Arianism. It earned its present name in the 800s when some relics from Saint Appolinaris were transferred here. 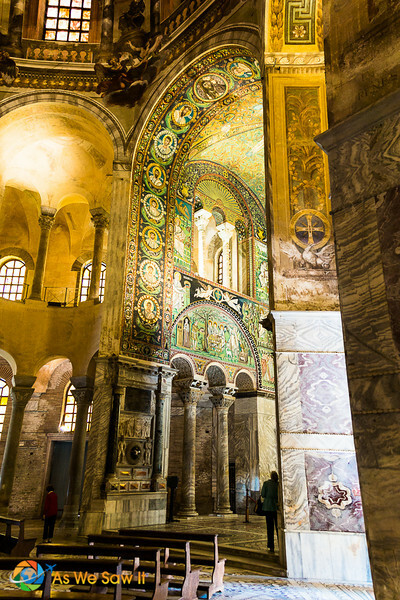 I think this basilica could easily be nicknamed for its most memorable feature: The Leaning Tower of Ravenna. 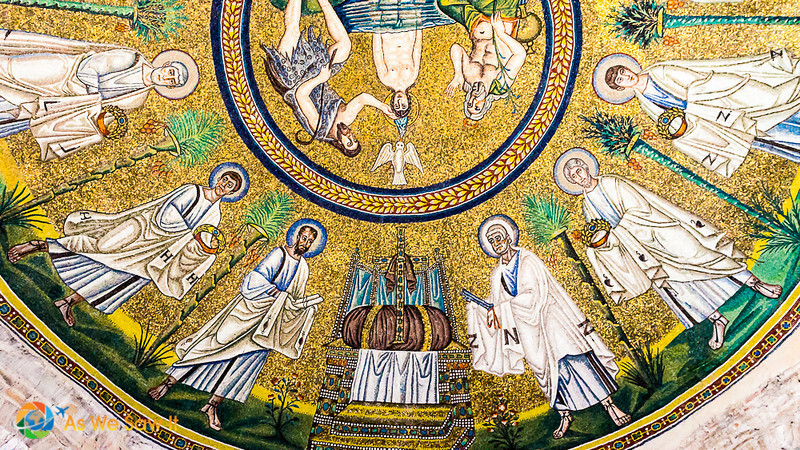 They say Pope Gregory the Great ordered that all the mosaics in the church be blackened. He felt that their “golden glory” distracted worshipers from their prayers. 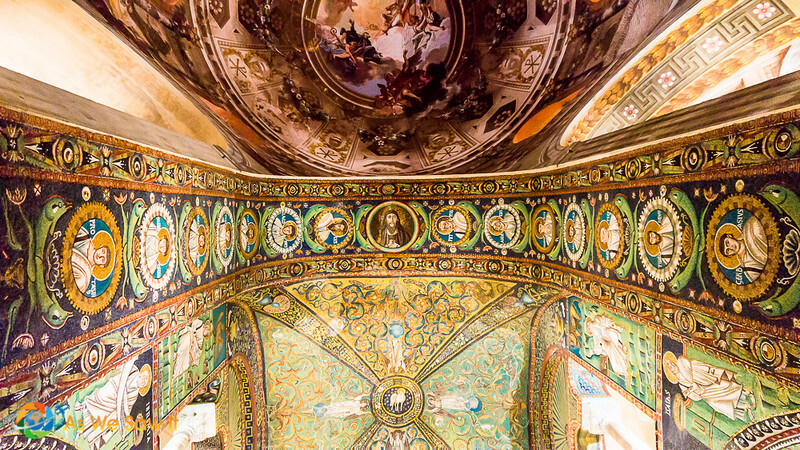 The Basilica of San Vitale is the best known and most popular of UNESCO's eight sites. Its Byzantine mosaics are the largest and best preserved outside of Constantinople, so if you don't want to go to Turkey, you need to be here. We had no clue what we were getting into when we walked through its doors, but oh, I'm glad we did. Oh. My. Gosh. They were everywhere, and I mean everywhere. Wherever we looked we saw mosaics. 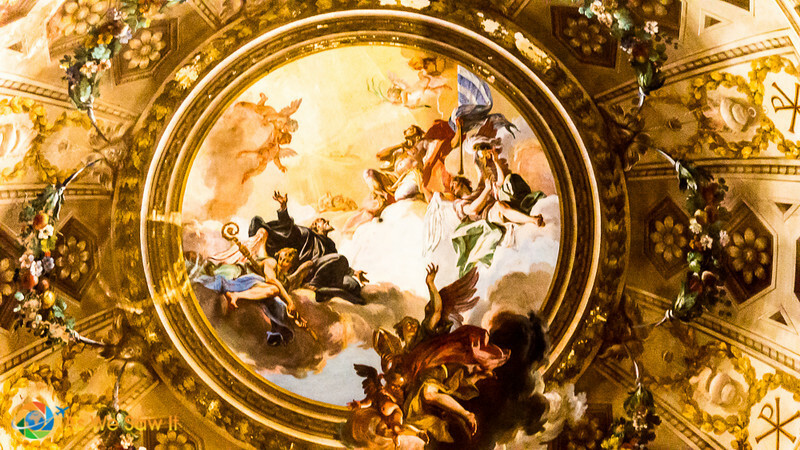 They were on the floors, on the walls, on the arches, and on the ceilings. And they were all so exquisite we didn't know where to look. Dan had a really hard time knowing where to focus his camera as well. Stand in an archway and look straight up, and this is what you'll see. 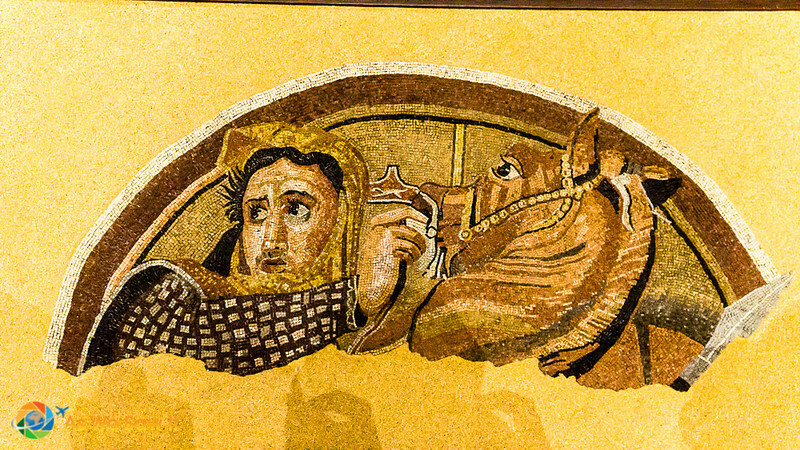 And not only mosaics, but fabulous paintings as well. And there was piadina. And it was good. Ah, piadina. Heaven on a plate. 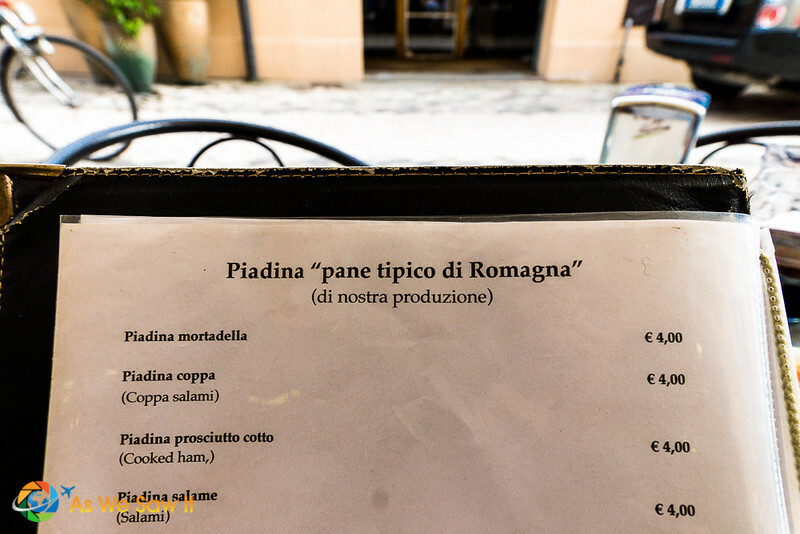 Our lunch was another highlight of our day in Ravenna and we discovered it through a tip from a local. Piadina is a thin, unleavened Italian flatbread that is typical of the region (Emilia-Romagna). It is usually made with white flour, olive oil, salt and water … but not all of them are so you have to ask. We had to make sure ours were vegetarian-friendly because some restaurants make it with lard. Ew. 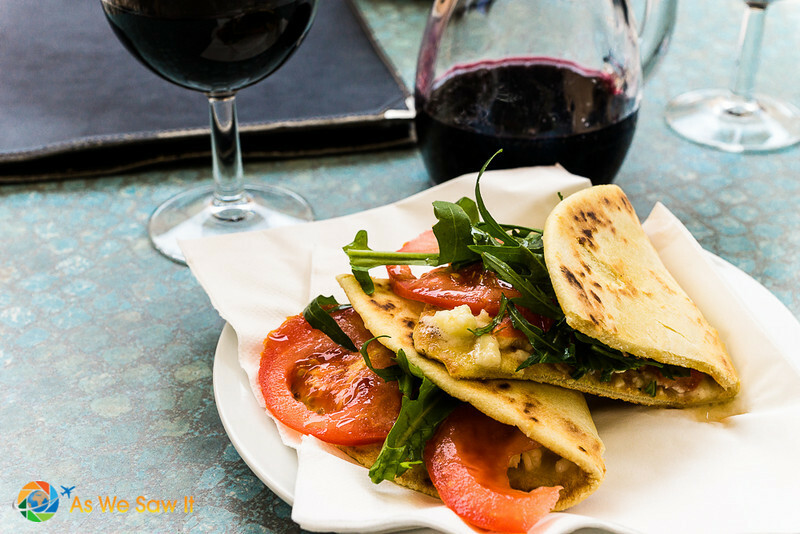 Piadine are usually made on-the-spot and served immediately. The warm, crispy rounds are filled to order. Choose a variety of cheeses, meats and/or vegetables, or get it with sweet fillings such as jam or Nutella. Ravenna has a local bread called piadina, and they can get very creative with what they put on it. Despite a wheat sensitivity I couldn't resist sampling the fragrant local bread. Mmmm…crisp outside, yet soft inside. Worth it? Yes. Dan tried, he really did, but photos just can't do justice to the city's mosaics. I am sure you'll agree if you get an opportunity to visit yourself. In the meantime, please go through our Ravenna photo gallery and let us know what you think. We have photos of the city itself, the mosaic museum, Dante's Tomb, some pretty churches, and of course, a whole lot more mosaics. Oh, and food. There's always food. For even more travel ideas, follow us on Pinterest and Instagram. 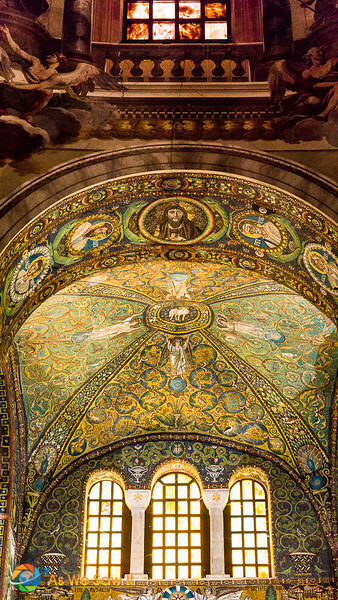 One of my favourite places in Italy… I love the Byzantines about a much as i love the Etruscans and this is one of the great sights of Italy- especially if you’re into mosaics! 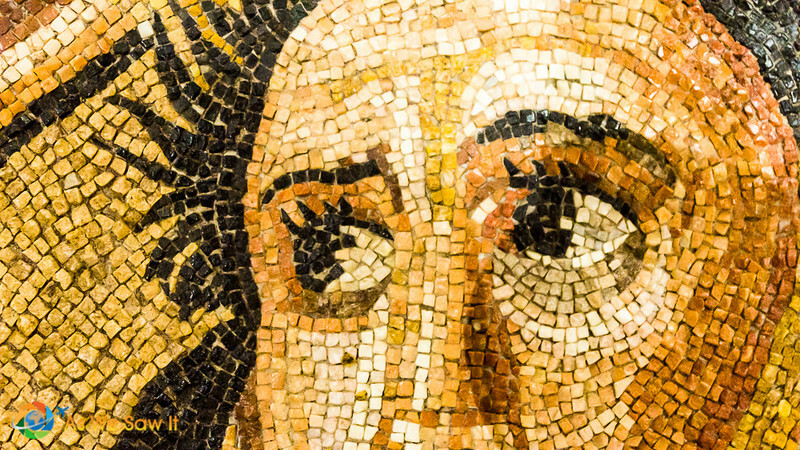 We were completely enthralled by those mosaics … it has added even more incentive to spend a whole lot of time in Istanbul. You are right, Linda, Ravenna is not a well known place. I didn’t know about it either, but it seems really worth a visit. You have so beautiful pictures of these mosaics. Very instructive video of how these mosaics are made. Italy seems to have a gazillion UNESCO sites that I’ve never heard of. Had it not been for its being on our cruise itinerary I don’t know if we’d ever have visited. I’m really glad we did, though. I thought that video was interesting too. Glad you liked it. 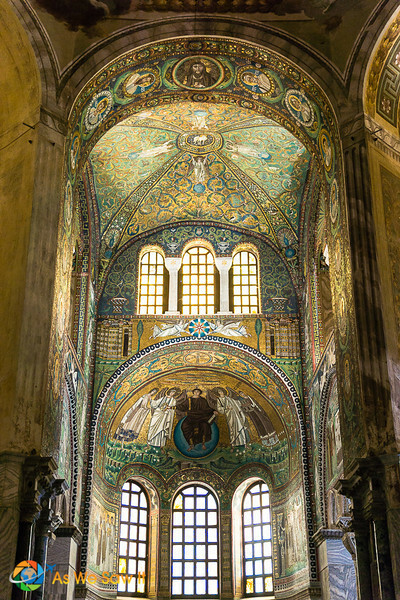 So enjoyed your photographs of Ravenna architecture. 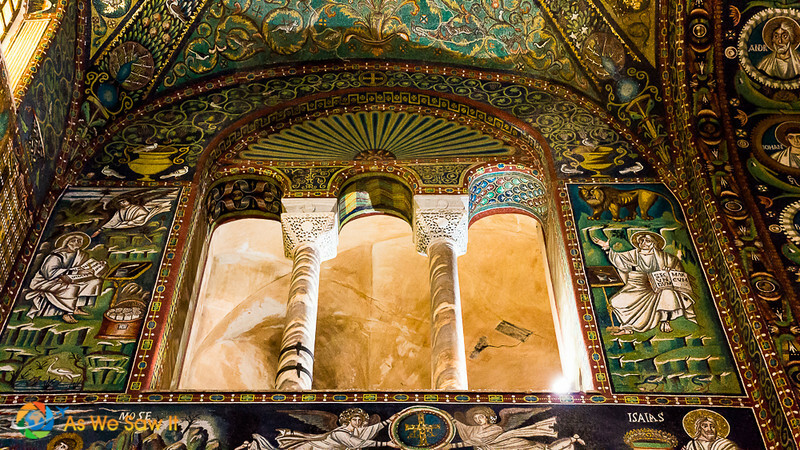 The Mausoleum of Galla Placidia impresses me most, for its relatively small size and, as you have mentioned, artistic detail. Did you know . 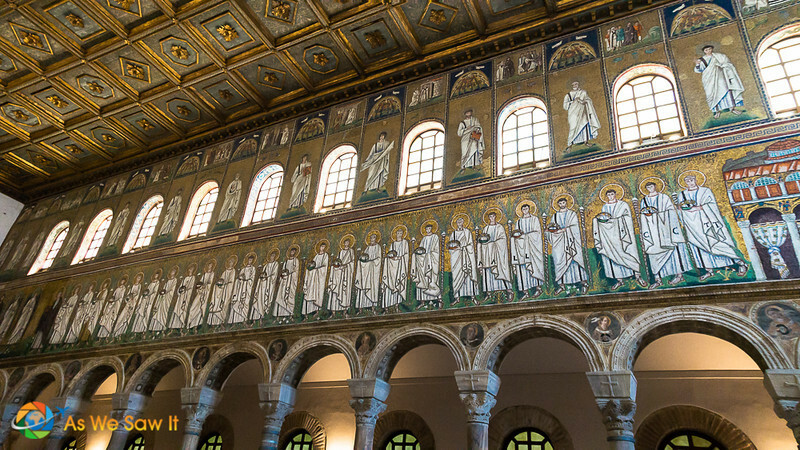 . . Galla Placidia may have been the first cruciform building? 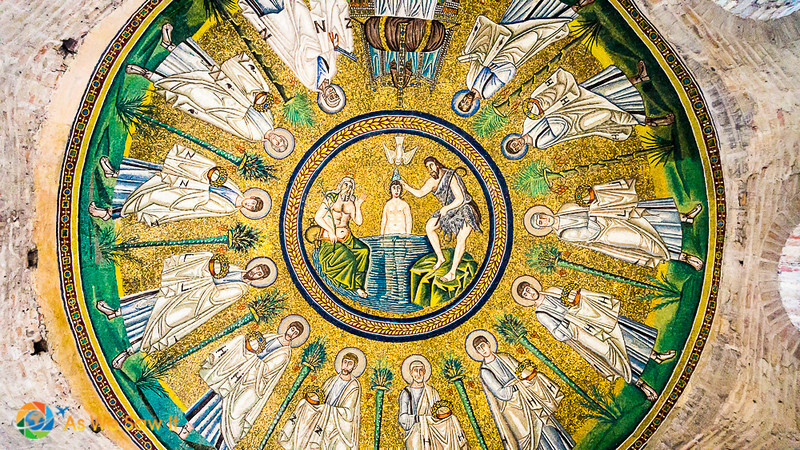 Looked for and found your very nice shot of the mausoleum’s central domed ceiling; decorated with rings of gold stars circling a cross in a midnight blue sky, it may be my favorite Ravenna mosaic of all. I was enchanted by that dome; it was truly beautiful. Have you visited? As yet, only in my design history-drenched dreams, Linda! 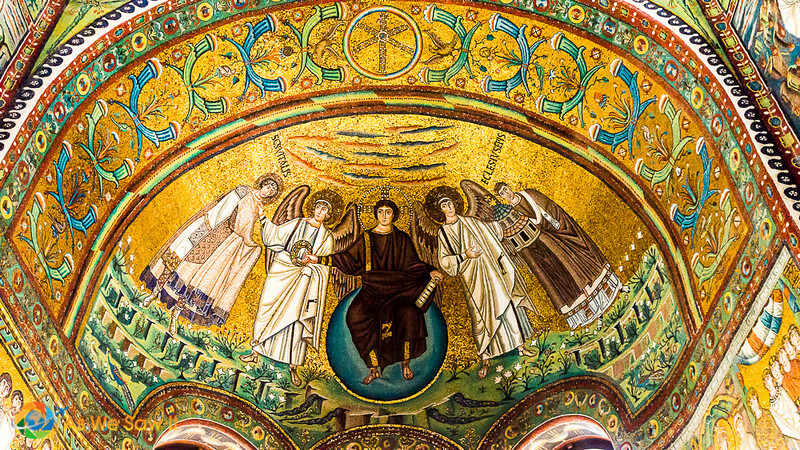 Ravenna may be too far south from where we’re now planning to be on our upcoming trip to Italy, but perhaps for the next one . . .
You’re heading to Italy? Fabulous! We’ve not seen the north (except for Venice, that is). Where are you going, and for how long? It sounds like a blast; can’t wait to hear about it. It’s unbelievable how those things were done manually! A real piece of art!